In order to supply electricity to the Thai and Lao grids, a transmission line of approximately 183 kilometers has to be constructed. To supply electricity to the Thai grid, a 67-km, 500-kV double circuit overhead transmission line will be built from the Power Plant to the Thai-Lao Border. 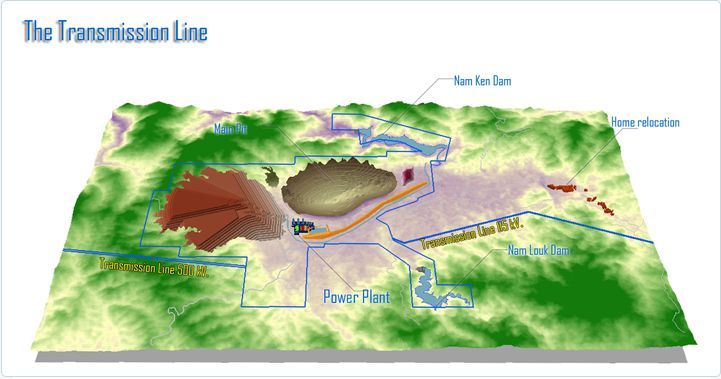 To supply electricity to the Lao grid, an approximately 115–km, 115-kV double circuit overhead transmission line will be built from the Power Plant to a substation near Hongsa town, and then to the Luang Prabang 2 substation. Apart from the 500-kV and the 115-kV double circuit overhead transmission lines, the Hongsa Town and the Luang Prabang 2 substations will also have to be constructed. Hongsa Power Co., Ltd. (VTE Office) 4th floor, Room No.D5 ; NNN Building, Phonsinouane Village, Bourichan Road, Sisattanak District, Vientiane Capital, Lao PDR. Copyright ? 2011 All rights reserved.